Traveling has been my number one passion for quite a number of years now and if you know me, you know I like to do it on a budget. I am totally one of those people that after I book I will check the flights over and over again to make sure I got the best deal. [FYI: Don’t follow my lead on that, it’ll drive you nuts] Budget airlines have been around since the 70’s and to be honest I never paid much attention to them… until now. Iceland has been on my radar for awhile but it just never happened. 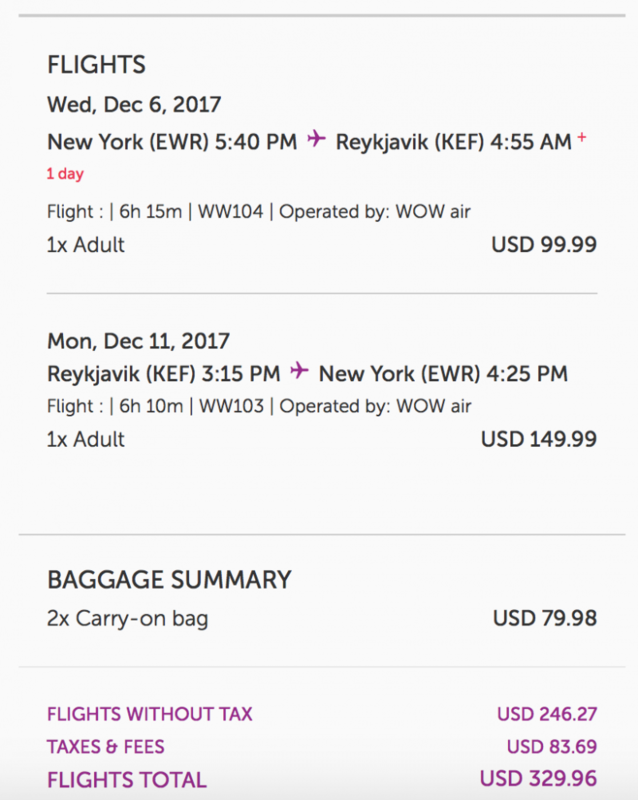 One random day in October of 2016 I was browsing flights for Iceland and came across a super low rate from an airlines called WOW air. When I told my husband the rate he insisted we book immediately and that is how our trip to Iceland for February 2017 came about. 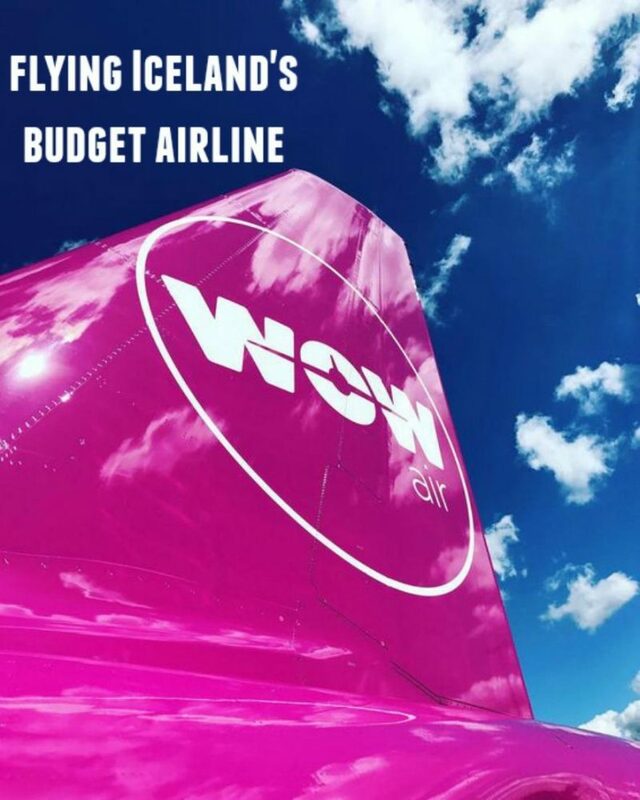 WOW air is an Icelandic low-cost carrier that is headquartered in Reykjavík and based at Keflavík International Airport. The airline was founded in November 2011 and serves 38 destinations across Europe, North America, and Asia. Ok – so lets talk details. Firstly, they offer direct flights to Iceland and that is also where you will connect to continue onto wherever your final destination is. You have to remember they are a budget airline so don’t expect the works but I promise you will get from point A to point B comfortably and at an incredible rate. One personal item measuring 17x13x10″ is always included with your paid ticket as well as checking in either a stroller OR carseat for your little one but that is where the extras that are included end. There are additional fees and they will vary each flight based on time of travel and final destination. 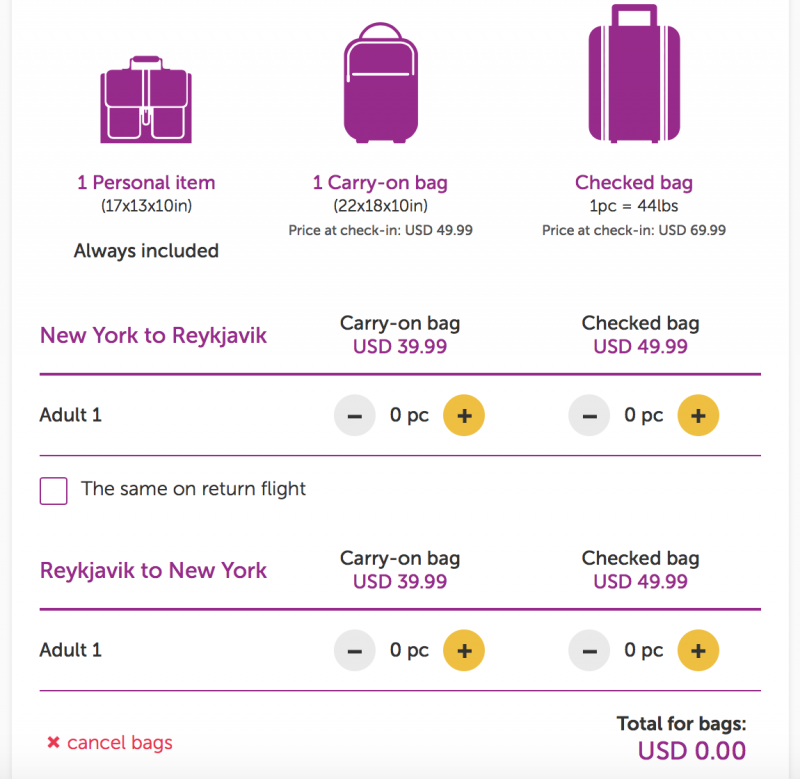 Here is a breakdown of the additional fees based on a random flight from Newark to Reykavik. 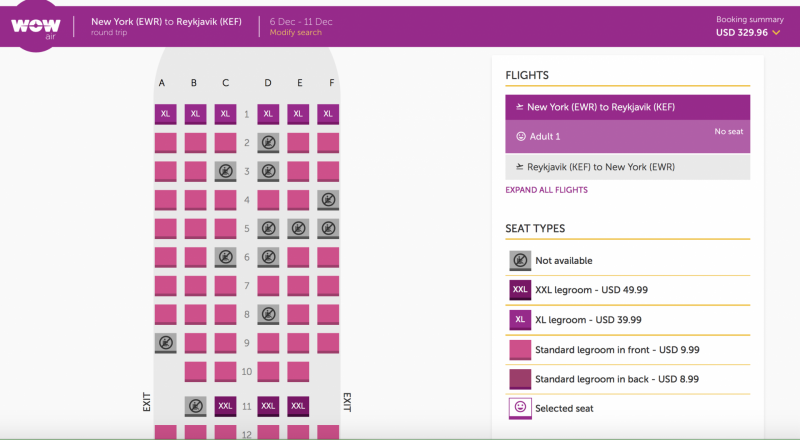 For a Basic, no added extras, flight you would pay $250! 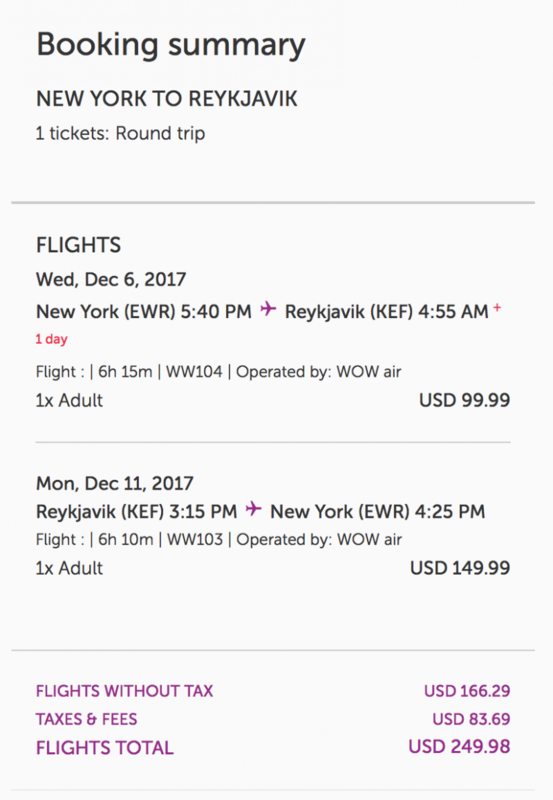 Guys – $250 RT nonstop for 4 nights in Iceland??? That is a steal! Can not upgrading your luggage be tricky… of course, but get creative when it comes to packing. Attire for Iceland is all about layering so pick items that you can reuse to make different outfits each day and wear your coat and winter boots onto the plane. If you decide to upgrade to a standard size carry on luggage you would then pay $330 per person for this flight. This rate is over $100 cheaper than another budget airline that flies this same route on these dates. Other airlines were over $600 for this same flight. You also don’t get to pick your seat unless you pre purchase and here is a look at those costs. I’ve flown with WOW for 2 separate trips and I was pleasantly surprised at how comfortable and roomy the standard legroom seats were so don’t feel like you have to go for that XXL seat…. unless you want to of course. My first flight with them we did not pre book seats and upon check in the agents were super accommodating in making sure our party sat together. 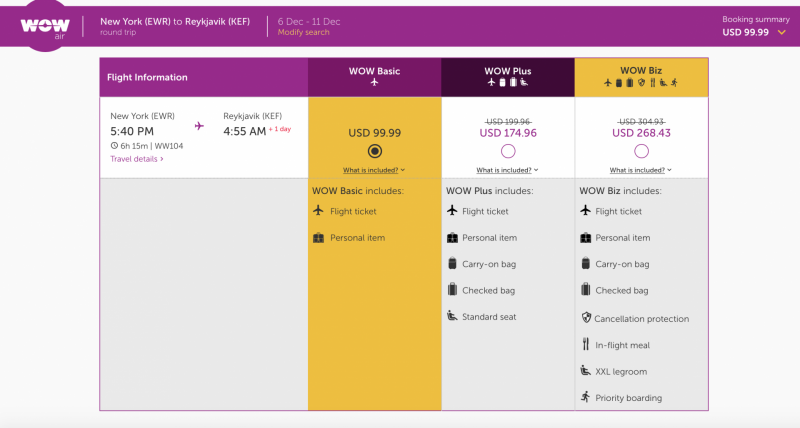 Another option for this flight is to book WOW Plus and that includes an assigned standard seat, a carry on bag AND checked bag for $400! That is a steal. 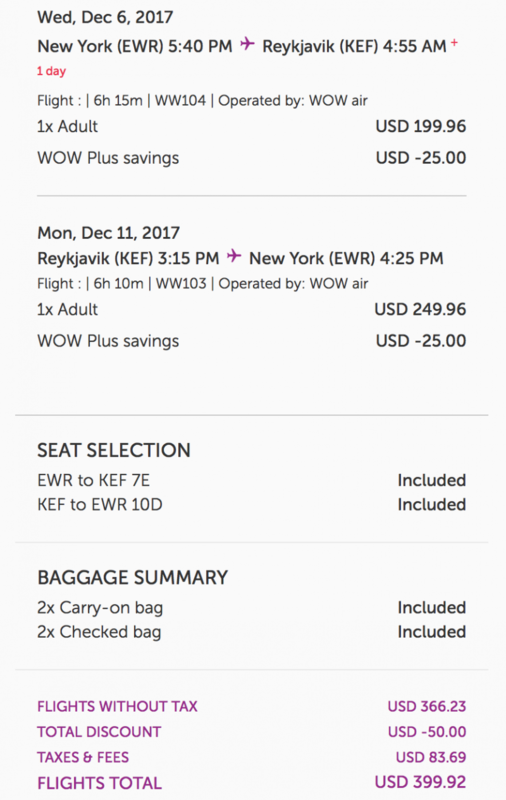 If you are traveling with someone and you were able to share luggage they could purchase the Basic rate and it would come out to a total of $650 for 2 adults for a 4 night trip to Iceland. All food and beverages on flight are also an added expense. I’ve had a few items from their menu and it was all tasty but if you want to save money, just make sure to pick up a bottle of water and something to eat prior to boarding. Overall I have nothing but great things to say about WOW Airlines. 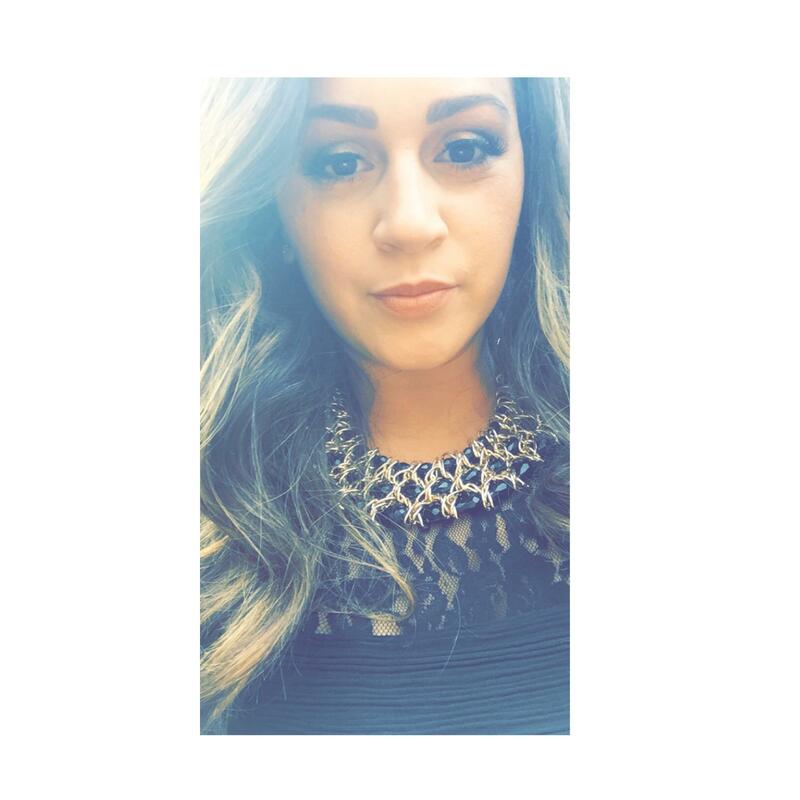 My family and I have had great flights with them and always experience really good customer service. As a mom, one of my FAVORITE features they have is the lap baby seat belt. I have never been offered this on any other airline. We look forward to our next flight with them! 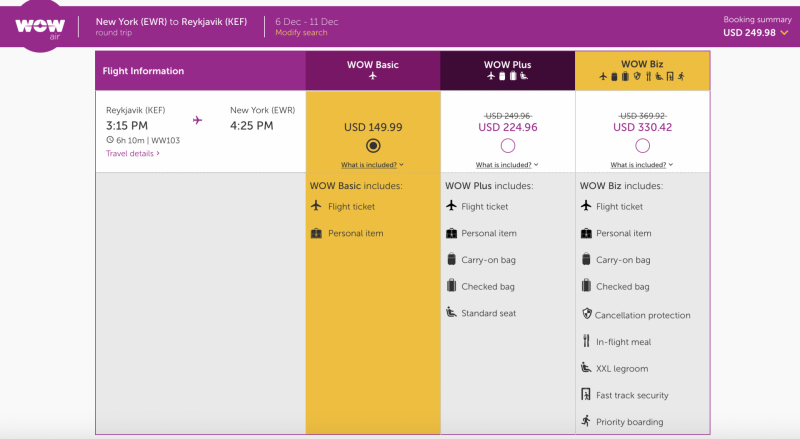 Have you flown WOW Air before?